(informal) "proper respect" or "proper recognition" for another person; an expression of approval or a special acknowledgment; accolade or accolades; praise. I've got to give props to Roger for the way he handled that situation. See some prop respect! Visit the Wall of Props! Recognition of those within our organization who provide excellent service to their co-workers. Internal customer service is a very vital glue that holds AFN together as a cohesive, functioning unit; giving AFN props is a way of rewarding those who not exemplify teamwork, but also do a little more, give a little more, and make AFN a great place to work. If the interaction left you wanting to give a high-five, thumbs up or pat on the back, take a minute to give that person AFN props. All AFN employees are eligible to give AFN props to all AFN employees (the only exception being oneself!). We can all give props to anyone who does something commendable, whether within or outside of our own department. 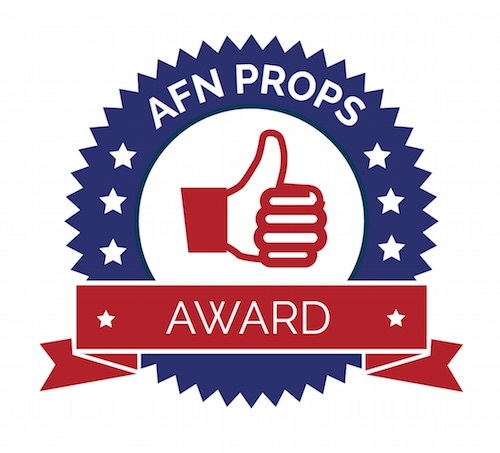 Who can receive AFN props? All AFN employees are eligible to receive AFN props. Some examples include: he/she handled a situation with finesse and made you smile, really kept his/her cool under pressure, or just picked up the phone when you called and made your job easier by being there. None. You can give AFN props to anyone, each and every time he/she does something that demonstrates excellent service. Please don't enter in your branch code and name. **One person per AFN prop.